The CP9175 is the Next Generation of Actron Scan Tools- designed by and built with Market Intelligence derived from you-the consumers. The new OBD II AutoScanner has more functions and benefits than other code readers currently available in the aftermarket. The new trilingual code reader from Actron is Internet updateable, displays freeze frame data and users can choose to view screen data in English, Spanish or French. OBD II AutoScanner CP9175 easily retrieves diagnostic trouble codes (DTCs) and code definitions from your vehicles computer, leading you to the problem area. Use on all 1996 and newer OBD II compliant vehicles: North American, Asian & European. Is your car's check engine light on? If it is, your car is trying to tell you something and the Actron CP9175 AutoScanner Diagnostic Code Scanner speaks its language. Use this scanner to unlock the information stored in your car's computer. Whenever your check engine light is on, the device can chrome://gcstoolbar/skin/feedbackimg2.gif chrome://gcstoolbar/skin/feedbackimg2.gif pinpoint the problem so you can fix it fast and be on your way. 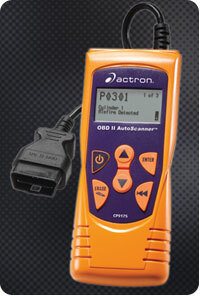 The Actron CP9175 easily scans and retrieves DTCs. View details. Read and erase trouble codes with "hot keys." Turn off that distracting "check engine" light. Based on the original and best selling CP9135, the next generation CP9175 has important additional features. In addition to allowing users to view data in English, Spanish, or French, the CP9175 is also Internet updateable. Plus, it displays freeze frame data, which provides a "snapshot" of the vehicle's operating conditions at the time of the fault. 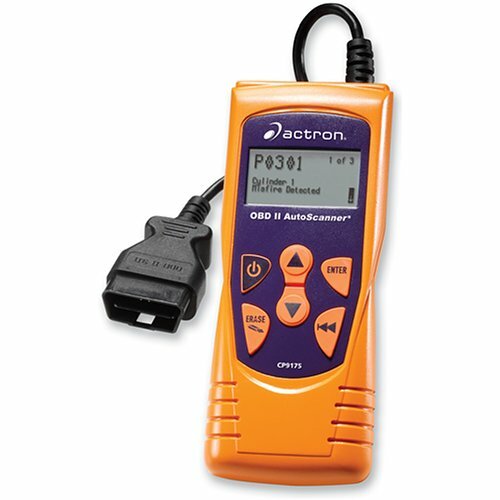 With more functions than other code readers available in the automotive aftermarket at comparable cost, the CP9175 easily retrieves diagnostic trouble codes (DTCs) and code definitions from your vehicle's computer, leading you to the problem area. The scanner is compatible with all OBD II (On-Board Diagnosis II) compliant vehicles manufactured in North America, Asia, and Europe from 1996 to the present. The CP9175 is fully updateable, so it is designed to accommodate future vehicles as well. The device features a large, easy-to-read liquid crystal display that shows the Diagnostic Trouble Codes (DTCs) and their definitions. And although you still have to fix the problem, the scanner will deactivate the "check engine" light on your dash so you'll no longer be distracted while you drive. The CP9175 is simple and easy to use. The attached OBD II 16-pin connector cable provides both data and power connections, while the eight-foot cable and rugged housing are both oil- and grease-resistant for added durability. The scanner is easy to connect to your vehicle, and a user friendly menu provides a variety of information in a snap. And thanks to a built-in rechargeable battery you can review the data you've gathered from the vehicle anywhere you please. Use the Monitor Status and I/M readiness (Inspection/Maintenance) function to determine if your vehicle is ready for an emissions test. I/M Readiness is an excellent function to use prior to having a vehicle inspected for compliance with a state emissions program, so you'll have a good idea if your vehicle will pass the standards. Another important thing to remember is that all emission testing facilities will fail a vehicle that has the "check engine" light illuminated at the time of the test--even if it is only lit to remind you of a past-due oil change or 60,000-mile tune-up. With this scanner, you can shut off the check engine light and pass the emissions test on your terms. The menu also alerts you of any pending DTCs and reads the malfunction indicator lamp (MIL) status. By reading the MIL status the scanner gives insight into what might cause your "check engine" light to turn on in the near future. In this way, the scanner also provides some preventive measures to help you keep a close eye on your vehicle's systems. These functions, combined with simple "hot keys" that are used to read and erase DTCs, make the CP9175 scanner a perfect solution for identifying problems with your vehicle and keeping you safe on the road. The scanner comes with CD software that contains more than 3,000 diagnostic trouble codes (DTCs) and their descriptions. 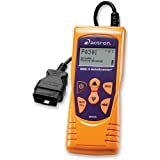 Actron CP9175 AutoScanner Diagnostic Code Scanner, CD software, and 8-foot cable. indicates a feature available with purchase of optional cable(s). My daughters engine light came on in her 2002 Camry. She took it to the Toyota dealer and they said the catalytic conver was bad. The repair would cost $1100. I purchased the Actron code scanner to verify what the dealer was telling her. The error code indicated her catalytic converter was below the operating threshold. I orderd a catalytic conver from the internet and replaced it in just over an hour. I reset the engine light with the CP9175 and she was back in business. Not long ago the engine light came on in my 1998 Camry, I took it to the dealer and was charged $590 to replace the oxygen sensor. If I had known what was wrong I could have ordered the part from the Internet for $120 and and it would have taken all of 15 mins to replace. I purchased this device with high expectations after reading reviews by several persons, only to discover it does not work on several OBD II equipped Japanese vehicles I've connected it to. It attempts a search of the vehicles' computer but the end result is an error message on the scanner's display screen. I just tried it again on my brother-in-law's 2005 Toyota Matrix only to get the same result. Even more disappointing is the lack of software updates for CP9175 which has also been noted by other reviewers who've purchased the device. Excellent scanner, does the job! Excellent item to have in your tool box. I am satisfied with this product. It is quick and easy to use. The only complaint I have is that it promises to erase fault codes therefore turning of the "service engine light" I found that even though it does the warning light comes right back the following day for the same reasons. Other than the above, the codes readings are clear and seem accurate. Amazing product and great price. Very well built. Easy to use without reading a manual. Comes with the codes stored in the handheld device. This scanner has paid for itself already. I used it to correctly diagnose several problems -- even contradicting a dealer's diagnosis (they later admitted I was right) with a faulty O2 sensor. True the codes are obscure--this isn't the scanner's fault, but rather the automotive manufacturers'. For whatever reason (i.e., greed), they choose to create proprietary codes that only their "high tech" scanners can turn into meaningful text. To combat this, the power of teh internets come to the rescue! I've plugged whatever code into my favorite search engine and come up with the answer every time. For the one guy who said this scanner was junk because it didn't keep the check engine light off, my advice is to dispense with trying to "fix" your car by yourself and just take it to a mechanic. The SCANNER'S PURPOSE IS NOT TO TURN OFF THE CHECK ENGINE LIGHT. The purpose _IS_ to help you figure out what is wrong with your car. If the problem isn't fixed, the light will keep coming back on again and again.